If you want to set yourself up for a better day tomorrow, you need to start tonight. 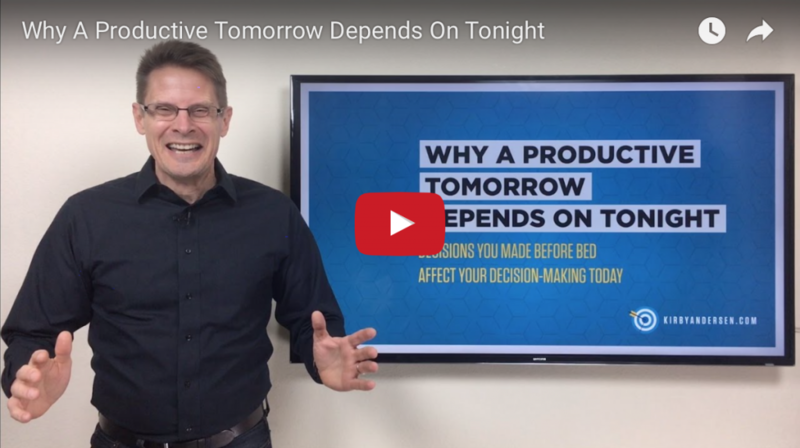 This video, Why A Productive Tomorrow Depends On Tonight, will help you stack the deck in your favor. How to set up a bedtime routine instead of pushing right up until you fall into bed. Taking 5 minutes or less to prepare tonight to give yourself a quick start in the morning. Regulating your surroundings to drastically improve your sleep. Why setting your attitude is even more important than setting your alarm. You owe it to yourself to do whatever you can to give yourself the edge you need for a better tomorrow. I hope this updated video and blog post give you a huge leg up in that process.